A friend of mine recently commented that although I am living in both the city and the garden, our city life is underrepresented in these posts. Of course, I began writing here when I was only living in the garden, and it has remained my focus but I see now that it is quite true that as a portrait of our daily lives, this blog is fairly unbalanced. This month is as good a chance as any to rectify that, and I wanted to start out by profiling one of the weekly markets that I visit. I would love to say that we grow all of our own food but sadly that is not the case (although it is our objective). For the time being, then, I visit the weekly vegetable markets around town to fill in the gaps. When Ali joined me in China way back in 2001, he was surprised that there was a daily vegetable market outside the university gates. It ran from about 5 to 730, and was frequented mostly by the neighborhood retirees. I used to go out and do Tai Chi at 530 with a group of retired teachers, and then we would all head out the gate to peruse the market. The predawn hours in Harbin were the domain of the elderly, lining up to buy milk from a man on a tractor, or haggling with the doufu-sheet man, selling his wares off the back of a motorcycle. In the winter months, vegetables were displayed under thick cotton quits to keep them from freezing, or else inside styrofoam coolers. When I entered the Thursday market in our old neighborhood of Sirinyali, I was struck by how fresh and lively everything looked. Here in Antalya, it is not the cold that zaps produce, but the heat. All summer long, the veg look beleaguered and parched. Now, with a few good rain storms under our belts and temperatures barely lifting out of the 80s, there seems to be a collective sigh of relief and feeling of weightlessness. And there is so much great veg to be had! I apologise for the photos — I know they aren’t great. I was using my phone, and if you can believe it the memory was all used up (I think I had better check and see if Kaya and Baki have been taking large sets of photos…) but I get to this market so rarely, I thought this might be better than nothing. I’ll take the real camera next time. 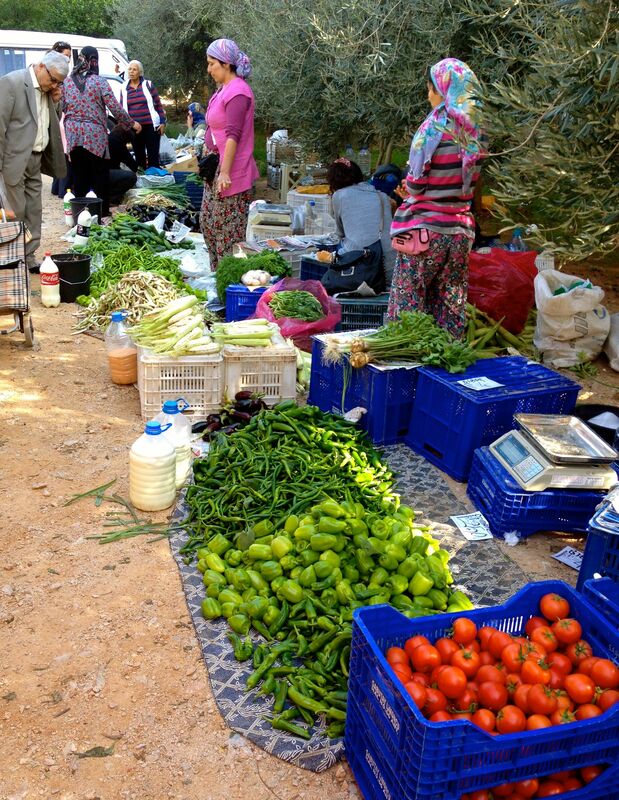 At the entrance to the market, there is an area where people come to sell stuff from their gardens. 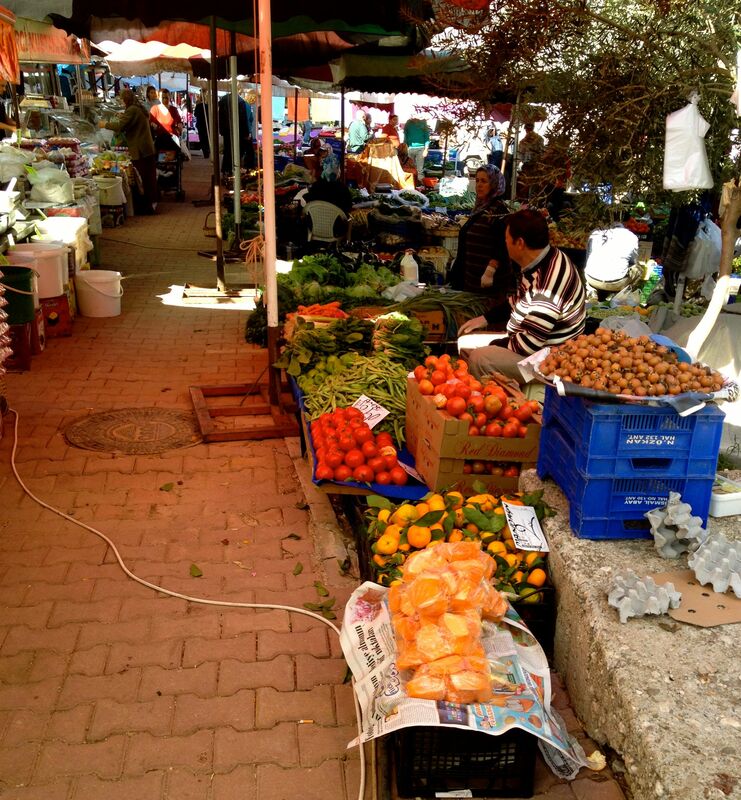 It is far less formal than the market itself, which is neatly lined up on tables along the side of the road, but I like shopping here better because it is all local and in season and from gardens as opposed to the stuff from the wholesalers. Under the olive trees, there is milk for sale, home made butter and cheese, eggs and nuts as well as the usual market offerings. The white corn in the photo above is an unusual sight — I usually only see yellow in the markets. There are usually folks selling offbeat finds like fresh pecans, or medlars, and in the spring you might come across wild asparagus or morels. I’ll visit a few more local markets in the coming weeks so that you can see how they differ from neighborhood to neighborhood. It all looks so wonderful doesn’t it?! My problem is I always buy waaaay too much! Me too. My uncle always used to say my eyes were bigger than my stomach! Medlars are small, round brown skinned fruits that taste like wild pears. They look like rosehips gone bad, or they do when they are ready to eat. They can be a bit fiddly, but they are tasty and autumnal. I’m catching up on all the posts I missed while traveling. I’ve enjoyed seeing this and the other markets…it is nice to be able to buy nice fresh produce. I’m so glad you’ve enjoyed them — I have a couple more that I’d like to take photos of this month. I love being able to pick and choose my veg.